Dunbeath Estate, with its spectacular castle perched on a high cliff-top promontory, lies on the north east coast of Scotland in the most northerly mainland county of Caithness, being 20 miles south of Wick and 90 miles north of Inverness. In 1452 the lands of Dunbeath along with the Earldom of Caithness and other lands in the county, were granted to the Crichton family by King James II. 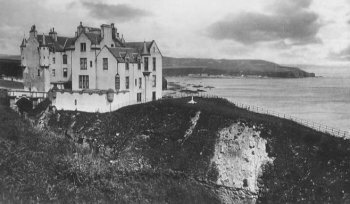 Shortly after this these lands passed into the hands of the Clan Sinclair, becoming one of its principal strongholds, until being sold in 1945 by the late Admiral Sir Edwyn Alexander-Sinclair. Some of the buildings still bear the Sinclair crest. John Nicholson, 19th-century antiquarian, extensively studied this region's ancient remains. Old school house opposite his home now a museum of region's early human history, a useful starting point for visiting brochs and other area sites. Old Ministry of Defence early warning station is unlikely setting for craft centre; visitors can watch various crafts, ranging from book-binding and weaving to jewellery and candle-making. The ruined church of 1619 has monument to Celtic bard Rob Donn. Crofting centre and resort above Torrisdale Bay. To north is Farr Bay, where precious stones can be found. Salmon fishing in River Naver and trout in Loch Naver, 15 miles inland. Church dating from 18th century houses museum of local history. Outside museum is Farr Stone, an early Christian Celtic stone. Village with 19th-century church. Inside church is 1558 memorial to Jan de Groot, who started ferry service to Orkney in 1496. When residing in nearby Castle of Mey, the Queen Mother attends services at Canisbay Church. Red-rock headland rising 360ft from sea, topped by 7Oft light-house. The Parbh -- 100 square miles of peat-bog, heather, scrub and rock -- lies inland. Only link to cape from outside world is ferry across Kyle of Durness. Cleit Dhubh, or 'Black Cliff, rises 850ft from sea south-east of cape. Well-ordered village built for men working in nearby quarries. Castletown's stone has paved the streets of Glasgow and Edinburgh; stone was sent out from neighbouring harbour of Castlehill--also built of this stone. world's first fast reactor to provide power for public use. Oounreay Exhibition tells story of nuclear power and has guided tours. Harbour is home to small fishing fleet. Dunbeath Castle still lived in but closed to public. Lhaidhay Caithness Croft Museum displays typical 18th-century complex with house, byre and stable all under one roof. Old village school houses heritage centre. Far north-eastern tip of mainland where lighthouse stands high above entrance to Pentland Firth. Most northerly point of British mainland. Viewing platform pro-vides 3600 view over 300ft cliffs, taking in Cape Wrath and Duncansby. Lighthouse stands below viewpoint, its walls battered by stones thrown up by Pentland Firth in rough weather. Crofting village spread out along coast. Along shore is three-chambered Smoo Cave. Its main chamber, over 200ft deep and 110ft wide, is accessible by foot. Allt Smoo burn flows from moor-land and drops 80ft into deep pool inside second cavern. Well-preserved burial chambers 2 miles north of Camster date from New Stone Age, beginning 6,000 years ago. Visitors can crawl down passage into chambers. Long cairn is nearly 200ft. Legless skeletons found in round cairn. Village based on local quarries that mined stone for street paving. The Fossil Centre at Mybster has displays on local flagstone industry. Area's best-known building is Castle of Mey, the Queen Mother's summer residence. Its gardens open occasionally in summer. Castle Arms Hotel, Mey, has royal photographs display. Quarries shipped flagstones from harbour a century ago. Bronze Age stone formation on hillock. Rows of small stones form a fan-like formation possibly for astronomical purposes. Claims to be mainland Britain's most northerly village, named after founder of ferry service to Orkney in 1496, Jan de Groot. Water mill established 1750 operates under original family. Harbour is important crab and lobster centre. Keiss Castle, 16th century, stands near private 18th-century castle. Three-mile stretch of sand on Sinclair's Bay lies south. Area's busiest fishing port has double harbour. Nearby Blairmore starts trail to Sandwood Bay. Village at meeting point of three lochs, Kylesku is across water. Boat trip up Loch Glencoul gives views of Britain's highest water-fall, 650ft Eas a Chual Aluinn. Rocky point north of Wick is crowned by two ruins. Castle Girnigoe, 15th century, has keep on cliff edge. Castle Sinclair dates from 17th century. Broad bay, with harbour of Fresgue to one side and village of Reay sheltering behind dunes. Small whitewashed church of 1740 has gallery for laird and family. Pink, pale sand and grassy dunes, usually deserted except for sea birds and, legend has it, mermaids. Beach lies 4 miles north of Blairmore, accessible by rough track. Swimming not advised. Begun as port for loading flagstones, town is now main ferry port for Orkney. Path leads up past lighthouse to cliffs of Holborn Head. Sailing club, sea angling. Britain's most northerly mainland town was laid out as Georgian 'new town' by Sir John Sinclair. Ruined Church of St Peter dates back to 13th century. Thurso Castle, largely rebuilt, dates from 17th century. Heritage museum. Village has gabled church, built 1680. Its boxed wooden gallery was once used by Mackay clan. Angling in Loch Loyal, 4 miles south. Ruined 14th-century Cais-teal Bharraich, built on Viking lookout spot. Ancient settlement, Vikings once sheltered here. Name comes from Norse Vik, 'bay'. Town plan is medieval, but buildings are mostly 18th century. Visitors can watch handmade glass being blown at Caithness Glass.